Hi, I’m Kendall Gammon, this is real talk with Real Media. 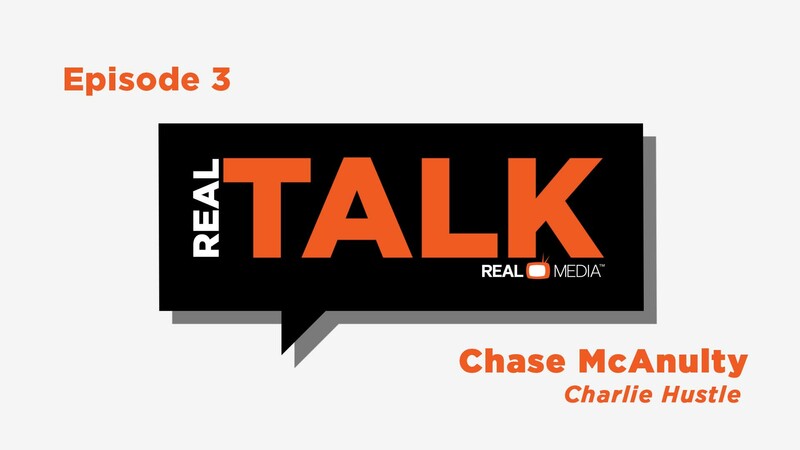 Today I’m joined by Chase McAnulty of Charlie Hustle. Chase, appreciate you joining us. KG: When you look at your company history, tell me how you got to where you are today? KG: I think what I hear you saying is you looked at yourself, and what you thought the need was from your point of view, and you turned that into a company that’s just been wildly successful. CM: Absolutely. And I think any kind of small business, or entrepreneur, kind of … they look for those opportunities, and try to find a solution that maybe that’s not currently out in the market. KG: One thing I’m curious about, what do you guys do better than everyone else? CM: Sure. I think we have a real millennial appeal. And that’s kind of attributed to maybe what we do in the community. I think as a young business owner, you see the millennial mindset wants to be involved in maybe something greater. And we’ve built resources, and kind of created this cool brand, but it’s based on a lot more than just the product that we put out there. We’re heavily involved with the community, and different charities, and giving back, and I think that goes a long way with the attraction to our company. And really has kind of laid some groundwork for our success. KG: It’s almost as if you’ve created a mass appeal to being individualistic, which is kind of nice. CM: Yeah, absolutely. I think this has always kind of been … I didn’t know if it was my dream or not, but it was something I was always interested in. And I think as a young business owner, that’s why you get into business. And it’s been a joy just to be able to do something that I love, and we’re kind of riding the wave. KG: How is the organization, Charlie Hustle, where do you see them going in the future? CM: Is kind of our focus. CM: But what is that for Nebraska? What is that for Iowa? And then we’ve built, again, those resources. We’re getting really good at creating garments. We produce everything just outside of Los Angeles, and it’s all shipped here, so opportunities kind of are coming with that. And other businesses are kind of forming, and so it’s just … you’ve got to stay the course and have that focus on your business, but there’s a lot of different things that we haven’t even tapped into yet that I’m real excited about. KG: And I think it’s … part of the success of Charlie Hustle, probably, I’m curious your thoughts, which is talk to me about the culture of Charlie Hustle? KG: It’s really amazing to me because when I look at what you do, and the apparel, and what you sell, you sell it in mass quantities, yet the people that wear it, they seem to feel unique, and I think that’s something that people want these days. CM: I think so too. I think it’s, again, it’s the storytelling piece, it’s something special that … whether it’s the shirt or just the brand, people have gotten behind it, and they want to back that. And I think that’s a very special thing. KG: We’ve talked about a lot of different things, the culture, where you’re going, where you’ve been, but something that I think is very dear to your heart and Charlie Hustle as a whole, which is how they give back? How does your company give back to KC? CM: Which kind of happened this last couple of weekends. And then Susan G. Komen breast cancer in October. But throughout the year we have a lot of different things going on, and a lot of different ways we give back as a company. My mother actually passes away four years ago to ovarian cancer, and that certainly gave a deeper perspective on life. And I think medical research nowadays, what’s been done is insane, and I think she might even still be here based on where we’re at today. So I think we have the ability to change lives, and giving back and cancer research, it’s such an important thing and it’s easy to say, but getting involved and doing it, and seeing the progress, I think that’s what’s most important. KG: Well certainly with talking with you and seeing the passion in your voice and what you do, the company wise, you’ve been successful and certainly giving back to the community as you talked about, and all those worthwhile functions is greatly appreciated, and very, very impressed. So I appreciate you stopping by and joining us today for this little chat, and it was great having you. For Real Talk with Real Media, I’m Kendall Gammon.